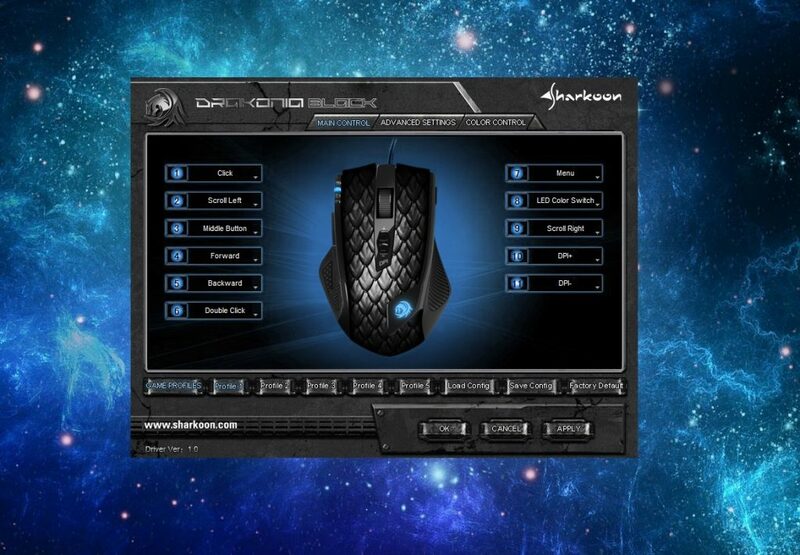 Today I am going to review the Sharkoon Dragonia Black Gaming Mouse. 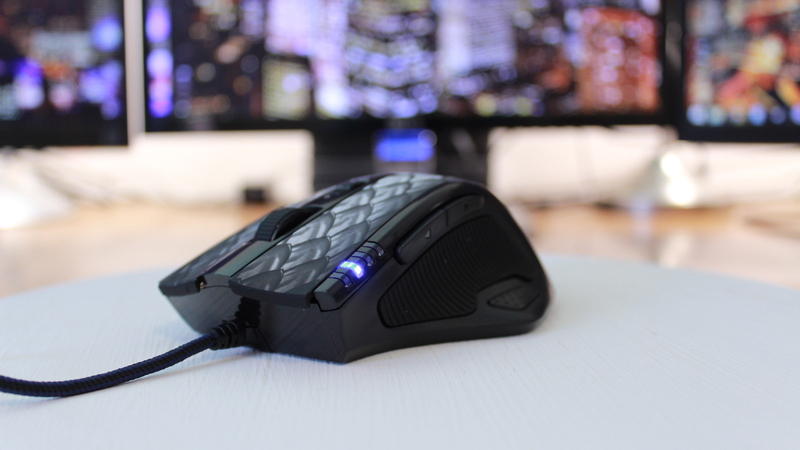 I have reviewed a few of Sharkoon’s mice and I have to say I have not been disappointed yet. So let’s see how the Dragonia does. First off the Sharkoon Dragonia Black is retailing of $39.99 on Amazon and has a Avago ADNS-9800 Laser sensor with a max DPI of 8200 and weighs in at 150 grams. It has 11 programmable buttons, max polling rate of 1,000Hz and has a lift-off distance of 1-5mm. The mouse comes in nice packed box with a flap so that you can see inside and feel the size of the mouse. Included with the mouse is a software CD and a small carry bag that you can put the mouse inside when traveling. 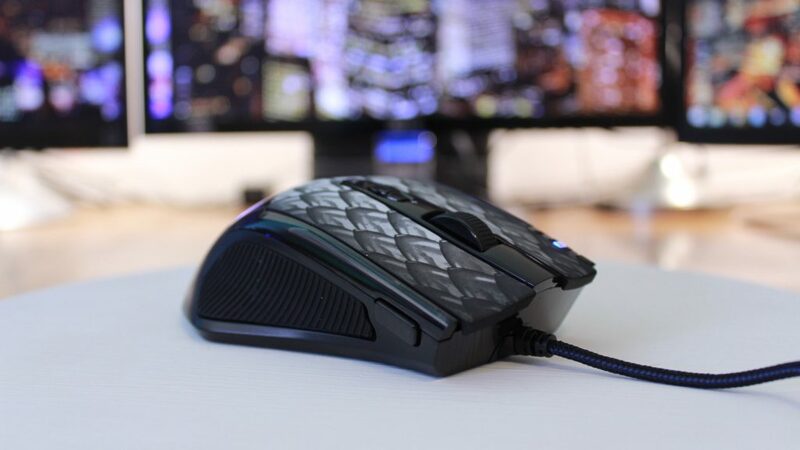 The first thing you see when looking at the mouse is the gray scale like pattern on top of the mouse. I know it represents dragon scales and fits the name. But personal I don’t like it, I would much rather wanted a all black mouse like the Shark Zone M51+. 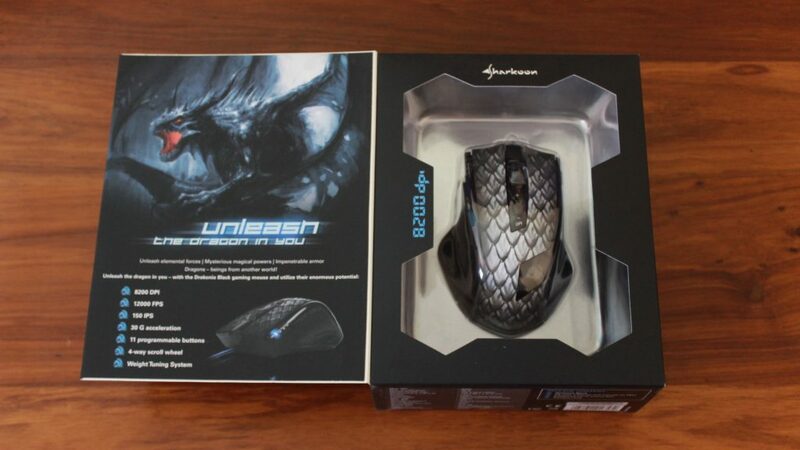 But this is not a deal breaker and the mouse looks very cool and comfy. Beginning on the left side you get a thumb rest with rubber padding so that your thumb won’t slip off. The thumb rest also has 3 buttons that you can use, one at the bottom that you can easily press by just applying some force to the side of your thumb. The other 2 is at the top and is very well placed. You wan’t have any problem pressing them if you have mid to large size hands. At the top you get your standard left and right mouse button that has a nice click to them. Moving a bit back you get the scroll wheel that has a rubber texture to give you grip while scrolling. The scroll wheel is also able to click left, right and down. This is a very nice future to have for all the gamers that like a lot of control right at there finger tips. 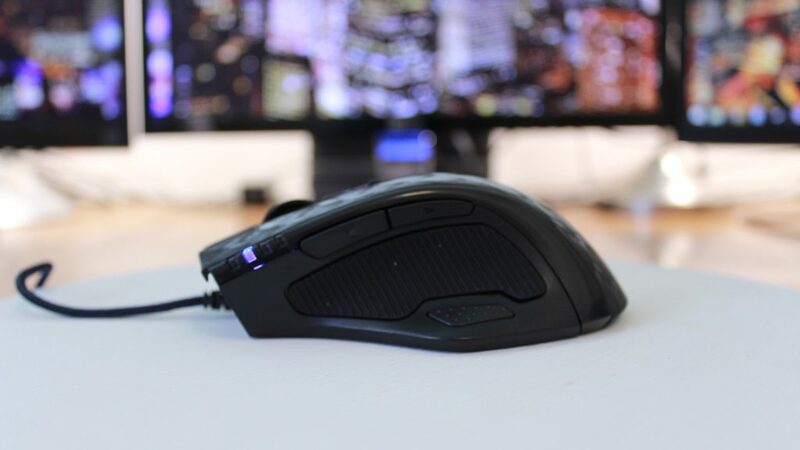 Just behind the scroll wheel is the DPI selection switch, that lets you switch between 600, 1200, 2000, 3000, 4800, 6400 and 8200 DPI. You are able to change the intervals using the software. 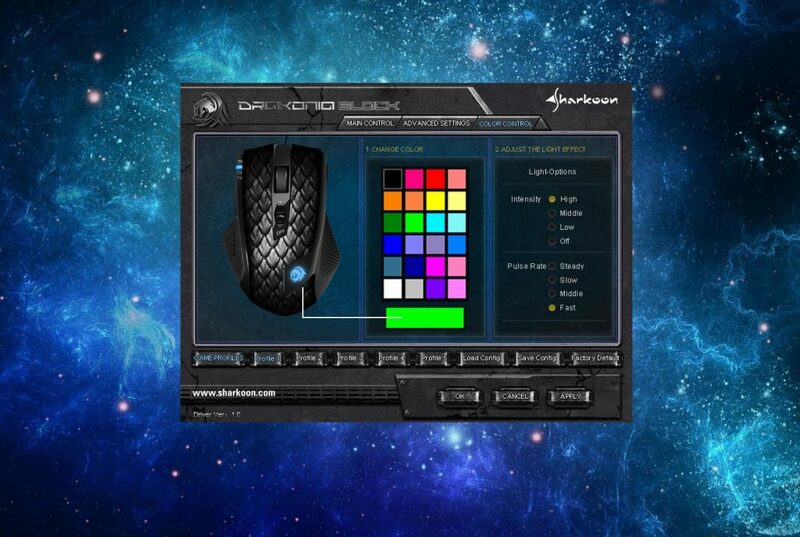 There is a DPI indicator on the left side of the left mouse button that will let you know on what DPI level you are on. On the right side of the mouse you have a pinkie rest with a rubber padding that should prevent your pinkie from dragging a long on the surface. At the front end of the pinkie rest is another button that will let you sickle through the different colors for the palm rest’s LED logo. You can program the button to do something else if you so choose. The palm rest has a nice height to it so you have a comfortable place to rest you palm. 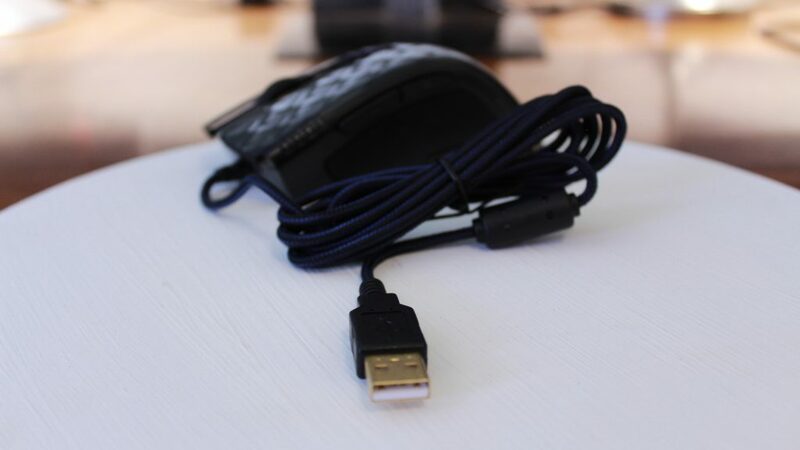 The Dragonia has a 180 cm (5.9 Feet) blue and black braided cable with a gold plated USB connection. 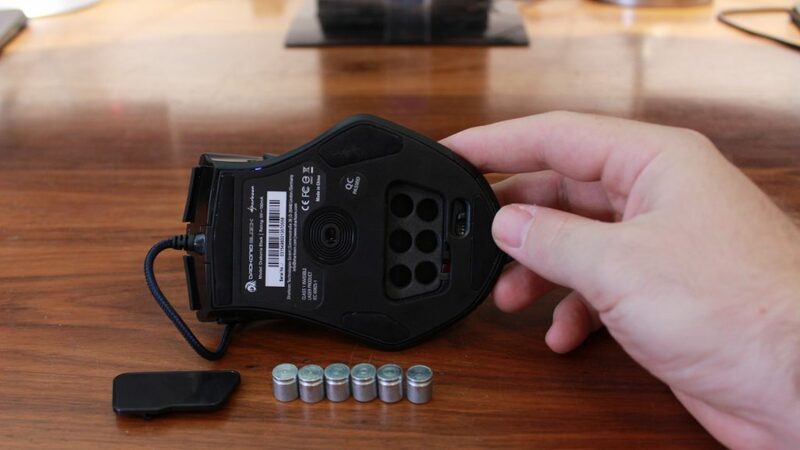 Underneath the mouse there are 4 large mouse feet, the Avago ADNS-9800 Laser sensor and a bay for 6x 5 gram weights. The software that you got with the CD is pretty straight forward. The “Main Control” tab let’s you program the 11 different buttons too whatever you want. You can also choose between 4 different profiles. The “advanced settings” tab is where you can adjust the mouse speed, scroll speed, double click speed, sensitivity, polling rate and the DPI setting. Lastly the “Color Control” lets you change the color of the logo on the palm rest. 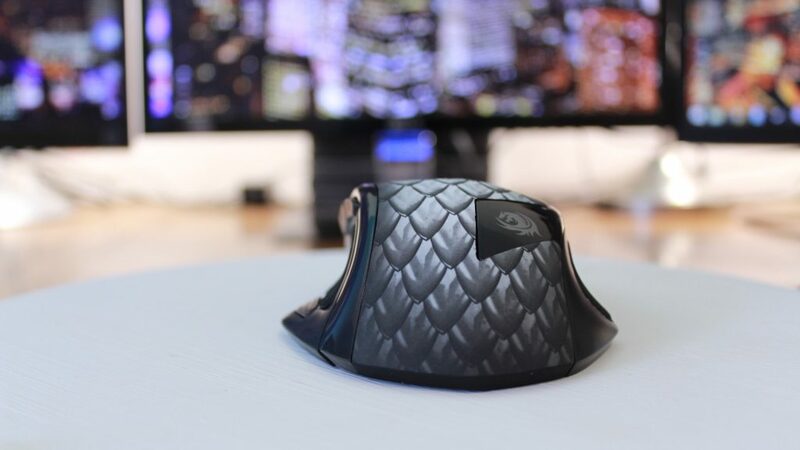 All-In-All the Sharkoon Dargonia Black is a superb mouse. The build quality is very good, has a very nice feel in your hand. The thumb rest I particularly like with the rubber grip and the 3 mouse buttons. The DPI switcher is also a nice feature to have, even though i never use a DPI switch. What I didn’t like was the the grey scale texture on top of the mouse. 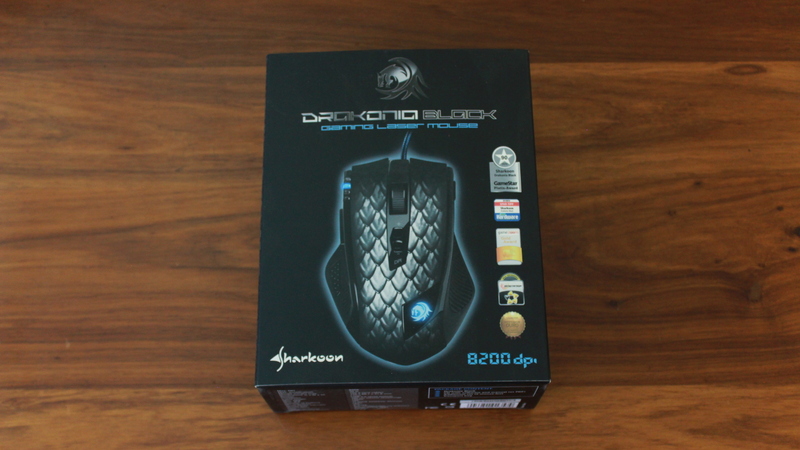 That was my review of the Sharkoon Dragonia Black a superb gaming mouse at a good price.